​PM Netanyahu: It is very important that this agreement has been prevented as of now, but a struggle is yet before us and we intend to continue this struggle in order to prevent Iran from becoming a nuclear threshold state that would endanger us and others. “We are anxiously monitoring the nuclear talks with Iran. We are also using our contacts and expressing our views, directly as well, in the international media, in my contacts with the American administration and other heads of government, in Minister Steinitz’s contacts with various security elements, in contacts with ministers in these governments and in the work of the National Security Council. “I think that an important thing happened today. We have always said that no agreement is preferable to a bad agreement and the agreement that Iran signed is a very bad and dangerous agreement for Israel, for the region and in my opinion for the future of the entire world. The Cabinet discussed three versions of draft Basic Law: Israel – the National State of the Jewish people, that of MK Zeev Elkin, of MK Ayelet Shaked and MK Yariv Levin, and of MK Robert Ilatov. The Cabinet decided to support Prime Minister Netanyahu’s draft principles. The Cabinet decided to support, in preliminary Knesset discussion, the aforementioned three draft versions on condition that their sponsoring MKs agree that their draft versions would be attached to the Government version to be presented by Prime Minister Netanyahu, which will be formulated on the basis of the principles detailed in the annex below, and will be adapted to it. The Government draft will be formulated in coordination with Attorney General Yehuda Weinstein. Defining the State of Israel as the national state of the Jewish people, and anchoring the values of the State of Israel as a Jewish and democratic state in the spirit of the principles of the Declaration of Independence. The Land of Israel is the historic homeland of the Jewish people and the place of the establishment of the State of Israel. The State of Israel is the national home of the Jewish people in which the Jewish People realizes its right to self-determination in accordance with its cultural and historic heritage. The right to realize national self-determination in the State of Israel is unique to the Jewish people. The State of Israel is democratic, based on the foundations of freedom, justice and peace in light of the visions of the prophets of Israel, and upholds the individual rights of all its citizens according to law. The national anthem is Hatikvah. The national flag is white with two sky-blue stripes close to the margins and a sky-blue Star of David in the center. The national emblem is a seven-branched menorah with two olive branches at its sides and the word ‘Israel’ below. All Jews are eligible to immigrate to the country and receive citizenship of the state according to law. The State will act to gather the exiles of the Jewish people and strengthen links between Israel and Jewish communities in the Diaspora. The State will act to assist Jews in distress and in captivity due to their being Jews. The State will act to preserve the historical and cultural heritage and tradition of the Jewish people and to enshrine and cultivate it in the country and in the Diaspora. All educational institutions that serve the Jewish public in the country will teach the history, heritage and tradition of the Jewish people. The State will act to enable all residents of Israel, regardless of religion, race or nationality, to preserve their culture, heritage, language and identity. The Hebrew calendar is the official calendar of the State. Independence Day is the national holiday of the State. Remembrance Day for the Fallen of Israel’s Wars and Holocaust Heroes and Martyrs Remembrance Day are the official remembrance days of the State. The regular public holidays of the State of Israel are the Sabbath and the Jewish holidays on which no worker shall be employed except under conditions to be defined by law; members of recognized faiths shall be entitled to rest on their Sabbaths and holidays. If a court shall consider a legal question that requires a decision and not find an answer in legislation, precedent or clear inference, it shall render a decision in light of the principles of freedom, justice, fairness and peace of the heritage of Israel. The Holy Places shall be guarded against desecration, any other damage and against anything that is liable to infringe on freedom of access by worshippers to the places that are holy to them or on their feelings toward those places. There shall be no infringement of rights according to the basic laws except by law that befits the values of the State of Israel, that is designed for a worthy purpose and which does not exceed that which is required. The basic law shall not be amended except by a basic law that is approved by a majority of MKs. “Last night US Secretary of State John Kerry updated me on the situation in the nuclear talks with Iran. We are anxiously monitoring developments in these talks. We are holding discussions with the representatives of other major powers and are presenting them with a vigorous position to the effect that Iran must not be allowed to be determined as a nuclear threshold state. There is no reason why it should be left with thousands of centrifuges that could enable it to enrich uranium for a nuclear bomb in a short time. Neither is there any reason why Iran should continue to develop intercontinental missiles, which could carry nuclear warheads, and thereby threaten the entire world. Therefore, no agreement at all would be preferable to a bad agreement that would endanger Israel, the Middle East and all of humanity. Over the weekend I instructed Cabinet Secretary Avichai Mendelbit, along with Interior Minister Gilad Erdan, to submit draft legislation to revoke rights from residents who participate in terrorism or incitement against the State of Israel. It cannot be that those who attack Israeli citizens and call for the elimination of the State of Israel will enjoy rights such as National Insurance, and their family members as well, who support them. This law is important in order to exact a price from those who engage in attacks and incitement, including the throwing of stones and firebombs, and it complements the demolition of terrorists’ homes, and helps to create deterrence vis-à-vis those who engage in attacks and incitement. Today, I will submit to the Cabinet the nationality law and the principles that I believe need to guide this legislation. The State of Israel is the national state of the Jewish People. It has equal individual rights for every citizen and we insist on this. But only the Jewish People have national rights: A flag, anthem, the right of every Jew to immigrate to the country, and other national symbols. These are granted only to our people, in its one and only state. I hear from people who say ‘Who needs this law? We’ve managed without it for 66 years.’ And I ask: Who needed Basic Law: Human Dignity and Liberty? We managed without it for 45 years. But both are necessary. Israel is a Jewish and democratic state. There are those who would like the democratic to prevail over the Jewish and there are those who would like the Jewish to prevail over the democratic. And in the principles of the law that I will submit today both of these values are equal and both must be considered to the same degree. This law is also needed now for another reason: There are many who are challenging Israel’s character as the national state of the Jewish people. The Palestinians refuse to recognize this and there is also opposition from within. There are those – including those who deny our national rights – who would like to establish autonomy in the Galilee and the Negev. Neither do I understand those who are calling for two states for two peoples but who also oppose anchoring this in law. They are pleased to recognize a Palestinian national state but strongly oppose a Jewish national state. On the eve of last Independence Day, I stood in the hall where the Declaration of Independence was signed in Tel Aviv and I promised to submit this legislation to the Cabinet and I am doing so today. I have not softened it and I have not changed anything. I have submitted the principles of the law that I believe in, the same principles that appear in the Declaration of Independence, the same principles that I absorbed in the Zionist sprit from my father, who absorbed them from Zeev Jabotinsky and from Binyamin Zeev Herzl. Thank you, Mr. Speaker, for your important and moving words. I believe they reflect the feelings of a great many Israeli citizens. When Israel is pressured to make concessions regarding its security, it is easiest to give in. We receive applause and attend ceremonies on lawns, but later the rockets and tunnels come. As Prime Minister, I stand firm with regard to Israel’s security. I care about the lives of each and every citizen and each and every soldier. I have been on battlefields many times. I risked my life for this country, and I am not prepared to make concessions that will endanger it. And it must be understood, our supreme interests, first and foremost security and the unity of Jerusalem, are not the top priority of those same anonymous sources that attack us and me personally. I am being attacked only because I am protecting the State of Israel. If I did not protect the State of Israel, if I did not stand up decisively for our national and security interests, they would not attack me. And despite the attacks I face, I will continue to protect our country; I will continue to protect the citizens of Israel. I would also like to add that I respect and appreciate our deep connection with the United States. Since the establishment of the country, we have had disagreements with the US and we will have disagreements in the future as well. However, they are not at the expense of the close relationship between our peoples and our countries. We have seen time and again, this year as well, that support for the State of Israel is ever increasing among the American public, and this support reached an all-time high. The strategic alliance and the moral covenant between our countries continues and will continue. It is the way of the world that after a person’s death, as the years pass the lines of their personality fade from our memories and their presence dims in public opinion and public consciousness. This did not happen in the case of Gandhi, Rehavam Ze’evi. In the 13 years that have passed since his horrendous murder here in the heart of Jerusalem, the special figure he represented has become sharper. Gandhi was a fighter and a man of letters. He walked the length and breadth of the country. Nothing undermined his confidence in the justness of Zionism’s path. He was consumed with a fire to complete his mission – to share his love for the Land of Israel, to contribute to the strength of the State of Israel and to ensure the well-being and security of the people of Israel. Gandhi dedicated the best years of his life to defending the country and protecting its borders. He knew that the fight against our enemies was not only a security-military campaign, but also a fight to prove the rightness of our path and the justness of our historic rights to the Land of Israel and in the Land of Israel. These two challenges still concern us today, just as they did in the past. Even in the sixty-seventh year of our independence, we still have to deal with significant threats to the security of Israel in a changing Middle East, a Middle East in which radical Islam has raised it head and its proxies compete to see which of them can be the most extreme. It is enough to look at an updated map of Iraq and Syria to see the chaos that is raging there, instigated by the followers of the idea of a caliphate. The black flags are flying and the crimson blood is spilling like water. In the face of the multitude of threats that surround us, we are determined to protect ourselves as necessary, first and foremost by defending our borders, and of course within our borders. Gandhi contributed significantly to this security doctrine. The more veteran members among us remember the years after the Six Day War. We remember the attacks that came from the Jordanian border, and we came to conclusions. Just recently we built a fence along a different border, our border with the Sinai Peninsula, a fence more than 200 kilometers long, a tremendous engineering wonder that helps us stop terror attacks from Sinai and the penetration of illegal infiltrators to the State of Israel. We are working diligently to strengthen our other borders similarly. Gandhi was a pioneer in creating a security doctrine and implementing it. When he was Head of the Central Command, he led IDF soldiers in a joint engineering and operational campaign to prevent penetration from the Jordan River. He led IDF fighters in dozens of pursuits of terrorists who sought to break through our eastern defensive line. “In Israel, the commanders led the charge in pursuits; they adhered to their mission, charged forward, sometimes at the cost of their own lives.” And indeed within a few years quiet was restored to the Jordan Valley, which was and remains the State of Israel’s eastern security border. As to the second challenge, Israel has long faced attacks on its right to exist. Some people deny the strong affinity of the people of Israel for its land, an affinity that was formed 4,000 years ago in the Land of Israel and 3,000 years ago with Jerusalem, the capital of Israel. Some people are not willing to recognize the right of our people to a nation-state of their own, who are not willing to recognize the right of the people of Israel to a nation-state for the Jewish people. This was and remains the root of the conflict. There are also quite a few people who accuse IDF soldiers of war crimes, even when we defend ourselves – when we defend ourselves with the highest morality against rocket attacks and terror tunnels, against a blood-thirsty enemy that uses its own children as human shields and does not care that these victims pile up. Or perhaps the opposite is true – the enemy does care and wants more and more victims, and more victims from among its own people. When we defend ourselves against such an enemy, we still face unbelievable hypocrisy and disrespect and baseless accusations. Quite a bit of this slanderous propaganda was discredited by Gandhi, using his knowledge and expertise which were matchless. He knew very well that the light of Israel had never been extinguished in the Land of Israel, and even when we were exiled from our land we yearned to return of the land of our forefathers. Zionism led to an unbelievable change: It ingathered the exiles back to our homeland; it transformed us into a strong and independent people; and it transformed Israel into a flourishing and prosperous country. Gandhi said, “The IDF is the only army in history that conquered the Temple Mount and did not destroy or loot the houses of worship on it.” This is a proven fact – only under Israeli sovereignty was the freedom of access to the holy places of all religions upheld. Only under Israeli sovereignty. So at this session in memory of Minister Rehavam Ze’evi, we will honor his great contribution, a dual contribution: First, his contribution to Israel’s security; and second, his contribution to deepening our national consciousness and proving our justness. May Gandhi’s memory be blessed. 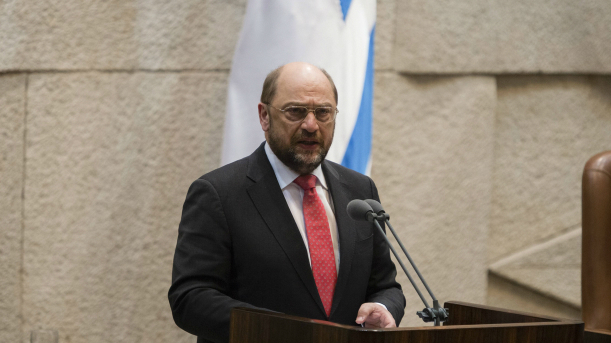 Leaders from Israel’s Right leaning parties, including Economics Minister Naftali Bennett and his Bayit Yehudi party left as European Parliament President Martin Schulz addressed the Knesset on the last day of his Israel visit and made incorrect statements about Palestinian freedoms and access to water. 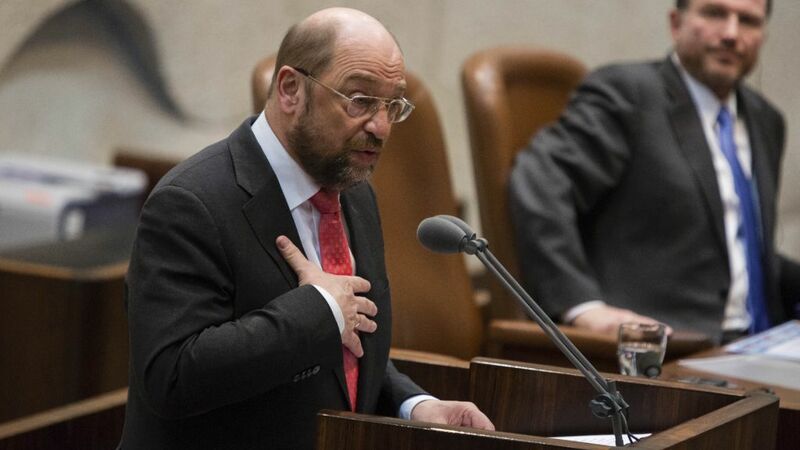 Bennett demanded that Schulz apologize for his ‘lying propaganda,’ and PM Benjamin Netanyahu stated it was “selective hearing” on the part of the EU President. It is a great honour for me to be in Jerusalem as a guest of the Knesset, the body which is the heartbeat of Israeli democracy, the body which symbolises the realisation of the hope cherished for so long by the Jewish people for a homeland of their own; following centuries in which the Jewish people were betrayed and persecuted throughout the world; following the unprecedented break with all civilised values which the Shoah represented; and following the barbaric murder of six million Jews. As a German who holds political office, and international political office at that, I regard it as my first duty to honour the following pledge: Never again. Never forget. We are all witnessing with dismay a return to ways of thinking which we thought had long been consigned to history, in the form of anti-Semitism, ultra-nationalism and populism. This merely strengthens me in my conviction that we must stand firm together – every one of us – against all those who stir up hatred. I believe that what the philosopher Edmund Burke said still holds true: ‘All that is necessary for the triumph of evil is that good men do nothing’. Acting responsibly means, for us, nurturing the European unification process, because integration between our States and our peoples was the response we Europeans found to the wars, destruction and murders which disfigured the first half of the 20th century. Unification and integration have helped us to banish the old demons and have immunised Europe against the threat of war. Yesterday I had a deeply moving experience. Together with Judge Gabriel Bach I visited the Yad Vashem memorial. I had the honour of meeting Judge Bach for the first time two years ago, on International Holocaust Memorial Day, which we celebrated at the European Parliament for the third time only a few weeks ago, together with members of the European Jewish Congress and survivors of the Shoah. I find Judge Bach’s life story very inspiring, and meeting him has restored my faith in justice. The fact that a 10-year-old boy who was driven from his homeland by a Nazi criminal in 1938 should later, as Deputy State Prosecutor of a democratic Israel, put that criminal, Adolf Eichmann, on trial, shows that there is such a thing as justice in this world. And that justice is something worth fighting for every day! Today, Israel is a robust democracy, a vibrant, open society with all the conflicts that implies, and a modern economy. The kibbutzim which once made the desert bloom have been replaced by hundreds of start-ups and high-tech research centres in which work is being done which will lead to the inventions of the future; minute microchips and robots, computer tomography and ultrasound scanners. Israeli researchers are world leaders in many areas. Israel has only eight million inhabitants, but it can boast seven major research universities, including the Technion in Haifa and the Weizmann Institute in Rehovot, and 12 Nobel Prize winners! Ladies and gentlemen, the Arab Spring has brought with it revolutions and upheavals in the region which are presenting Israel and the EU with new challenges. Together, we can exert a positive influence on developments in our neighbourhood. This is a responsibility we cannot ignore. But there are also grounds for hope: Tunisia’s new constitution is a document to gladden the hearts of all democrats. The EU will always support those who commit themselves to upholding democracy and universal human rights. This sense of hope is creating a new opportunity to establish peace in the region. I understand that bitter experience may make some people reluctant to extend the hand of peace. People in this chamber know much more about the Holocaust than I do. There are people in this chamber who risked their lives in wars waged to secure Israel’s survival. For years on end, Israel’s neighbours challenged its very right to exist. No one has forgotten the open threats made against Israel by the last Iranian President, or the fact that not so long ago political gatherings in Tehran ended with the words ‘Death to Israel’. We know that the Israeli people want peace. Courageous men such as Menachem Begin, Yitzhak Rabin and Shimon Peres held out the hand of peace and signed agreements in Madrid and Oslo. The hopes embodied in those agreements have not always been fulfilled, and this has made some people pessimistic about the prospects for peace in the future. Others, only a small minority to be sure, are even actively working to scupper any peace agreement which might be signed. On the Palestinian side as well, courageous men and women are working for peace. In recent years, building on their impressive ‘no violence’ policy, Mahmud Abbas and Salam Fayyad have developed modern institutions and done much to establish law and order. Two days ago I spoke with young people in Ramallah. Like young people everywhere in the world, their dream is to train, study and travel, to find work and to start a family. But they have another dream as well, one which concerns something most young people take for granted: they want to be able to live freely in their own country, with no threat of violence, with no restrictions on their freedom of movement. The Palestinian people, like the Israeli people, have the right to fulfil their dream of creating their own viable democratic state. The Palestinians, just like the Israelis, have the right to self-determination and justice. One of the questions these young people asked me which I found most moving – although I could not check the exact figures – was this: how can it be that an Israeli is allowed to use 70 litres of water per day, but a Palestinian only 17? One of the main bones of contention is Israel’s settlement policy. As you are no doubt aware, both the European Parliament and the United Nations have adopted numerous resolutions which criticise the ongoing process of building and expanding settlements and call for it to be halted. In the eyes of the EU and the entire international community, the fact that East Jerusalem is cut off from the West Bank is certainly an obstacle on the road to a peaceful settlement. The blockade of the Gaza Strip is your response to attacks on Israeli civilians and I can understand that. But it is stifling all economic development and driving people to despair – despair which in turn is being exploited by extremists. The blockade may in fact undermine, rather than strengthen, Israel’s security. This was the question which lent the initial impetus to the European unification process, and the founding fathers of the European Union came up with the answer. My grandparents’ generation would have regarded reconciliation with the arch enemy France as impossible. But the impossible came to pass, through a simple acknowledgement of the fact that if Europe was not to continue tearing itself apart on the battlefield we Europeans had no choice but to make peace and work together. I believe that if we want to grant people a life in dignity there is no alternative to peace for the Israelis and Palestinians today. It was because our neighbours were prepared to hold out the hand of reconciliation to Germany, which had started the war in the first place, that Germany was able to find its place in the international community once again and become a stable democracy. As Yitzhak Rabin put it so aptly, ‘peace is something you make with your enemies, not with your friends’. Yes, we achieved reconciliation. Then, through the efforts of courageous men and women, who planned for and organised peace, the idea took root in people’s hearts and trust grew. Giving young people fresh hope in a better future is certainly our most important task as politicians. To do this, we must also safeguard the competitiveness of our economies in the globalised 21st century. Only in this way will jobs – good jobs – be created. Our economic ties are already close. The EU is Israel’s most important trading partner and our cooperation in the area of research, science and technology is the basis for our future economic strength. Our competitiveness in a globalised world will hinge on two things – innovation and education. The Israeli-European research community is already into its third generation and its members are forging ever closer links. Israel’s formal involvement in the EU’s Horizon 2020 programme, which will start soon, will take our cooperation to a new level. Horizon 2020 is the largest research and innovation programme there has ever been. It promises to yield more breakthroughs and discoveries because it will provide backing for every stage in the process of turning ideas tested in the laboratory into marketable products. Scientific cooperation is already the most successful aspect of our partnership. I am convinced that as a result of our cooperation under Horizon 2020 new records will be set. I am also particularly delighted that more and more Israeli students are taking part in the Erasmus Mundus exchange programme. “I would be happy if I could join those voices around the world that are praising the Geneva agreement. It is true that the international pressure which we applied was partly successful and has led to a better result than what was originally planned but this is still a bad deal. It reduces the pressure on Iran without receiving anything tangible in return and the Iranians who laughed all the way to the bank are themselves saying that this deal has saved them. I spoke last night with US President Barack Obama. We agreed that an Israeli team led by National Security Adviser Yossi Cohen will leave soon for the US to discuss the permanent agreement with Iran.